The highly rumored Samsung i900 is finally unveiled by Samsung. Called Sumsung I900 Omnia, this Windows Mobile PocketPC seems as a strong competitor of the rumored 3G iPhone, which should be announced today too. Of course, the feature set puts it head-to-head with HTC Touch Diamond too. However we have the feeling that the HTC TouchFLO 3D might be a bit more spectacular than what the Samsung i900 offers. Samsung i900 Omnia will be first displayed at the CommunicAsia expo held in Singapore from June 17 to 20 but all details about its specifications are already made public. Based on Windows Mobile 6.1 Pro, the Samsung i900 offers a 3.2-inch WideQVGA display (240 x 400 pixels) and an optical mouse much like the one found in the Samsung I900 . Camera-wise the Samsung i900 Omnia is one helluva amibitious handset - offering a 5 megapixel auto focus snapper with face and smile detection plus auto-panorama shot. Geotagging is also among the camera features since the i900 also packs a built-in GPS receiver. As style has it, the Samsung i900 Omnia waistline is only 12.5mm and the brushed metal back certainly adds to its refined looks. That figure along with the other dimensions makes it rather identical to the Apple iPhone. Most importantly the i900 shares with the iPhone the same massive internal memory - both an 8GB and a 16GB i900 versions will be available with the microSD still present for further expanding those with up to 16 gigs worth of storage. The specs sheet of the Samsung i900 is then boosted by the quad-band GSM/GPRS/EDGE support plus HSDPA 7.2Mbps. Thanks to the built-in accelerometer, the UI automatically rotates to follow the handset's current orientation. Wi-Fi support is also on board to make the i900 sound even juicier. The USB port, FM radio with RDS and stereo Bluetooth (A2DP) are among the final touches to this loaded PocketPC. And since touch-optimization is of critical importance when you strive to compete with Apple's iPhone, Samsung have also ported their TouchWiz user interface for use on Windows Mobile. We saw that Touch UI for the first time on the Samsung F480 and we surely enjoyed it. 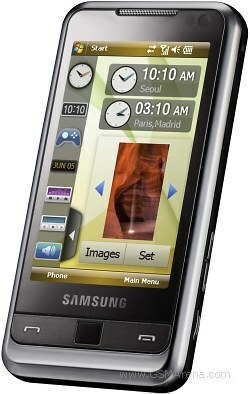 The Samsung i900 Omnia will be market available from June 2008 (Europe - July 2008), which also coincides with the projected availability of the new 3G iPhone. Since we had the opportunity to spend some time with the Samsung i900 Omnia before its official release, we can gladly provide you with some more detailed real-life shots as well as a 3D View of samsung I900 Omnia. Enjoy!